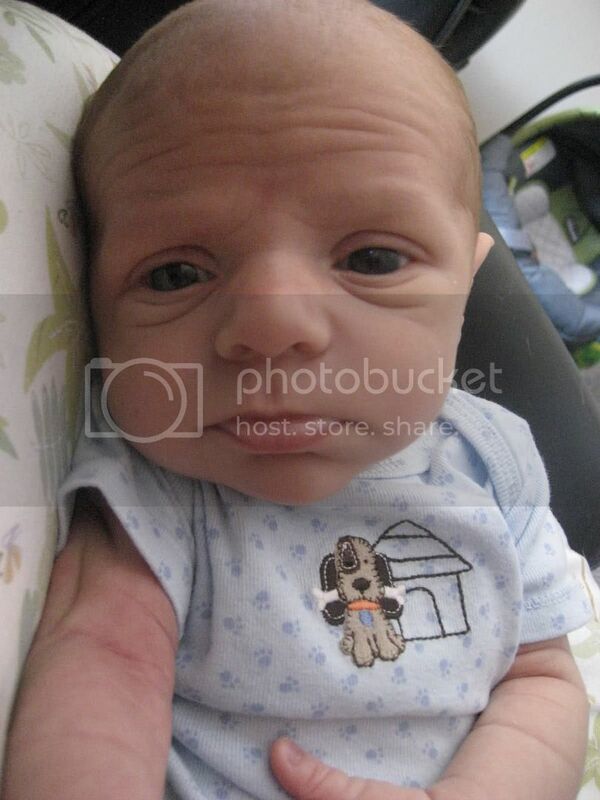 They need to spray some hair in his head or airbrush those thin spots. He mesmerised the world with his jaw-dropping good looks, rocketing to fame when snaps of his mugshot went viral in 2014. 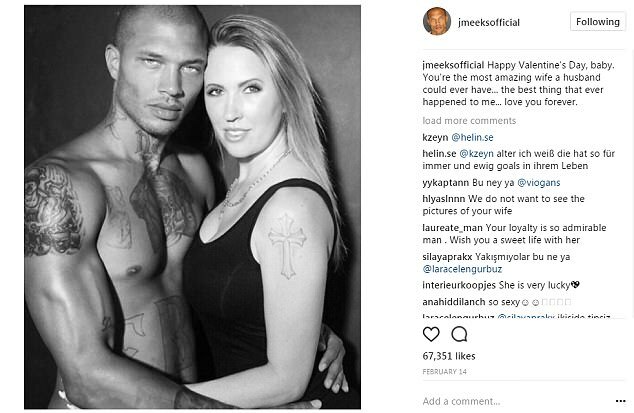 And three years on, Jeremy Meeks continued to send tongues wagging after pictures emerged of him kissing British Topshop heiress Chloe Green on a yacht in Turkey on Friday. 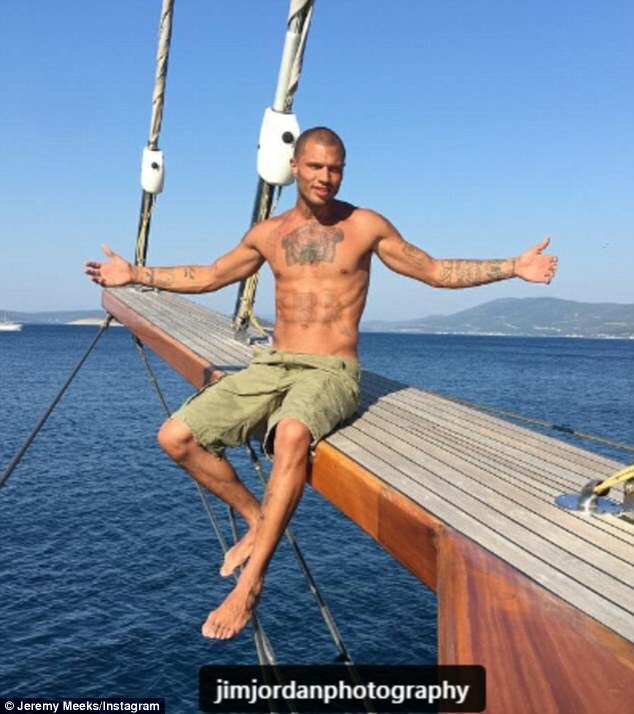 The hunky former felon turned model, 33, looked to be enjoying a luxurious cruise in the Mediterranean with 26-year-old, just days after his wife Melissa Meeks shared an emotional Instagram post. 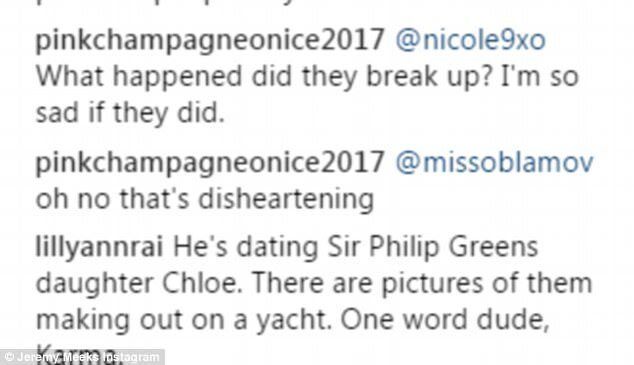 The pictures, which appear to show him kissing the former Made In Chelsea star, come as a source told The Sun: 'Chloe seems quite taken with Jeremy, and who can blame her? But the source added that her billionaire father Sir Phillip Green, who owns retail umbrella Arcadia Group, may not be quite as impressed, as he is 'very protective'. Summer has arrived and if you're looking for some holiday inspiration, look no further than Chloe Green who seems to be forever on vacation. This week she was spotted aboard a yacht with hunky Jeremy Meeks and posted this snap of one of her holiday looks. Opting for white to show off her hearty tan, the heiress sported a swimsuit teamed with a pair of chain and pearl embellished denim shorts by Forte Couture. We're loving this glam take on classic denim cut-offs, which make a great suitcase staple for wearing from the beach to the bar. Both Jeremy and Chloe have separately been sharing sun-soaked snaps from the same location, both tagged with his manager, Jim Jordan photography. But another defended him, adding: 'Maybe they have broken up. Haven't seen neither of them post each other up on their pages for awhile. I doubt he would do anything in public if they were still together'. 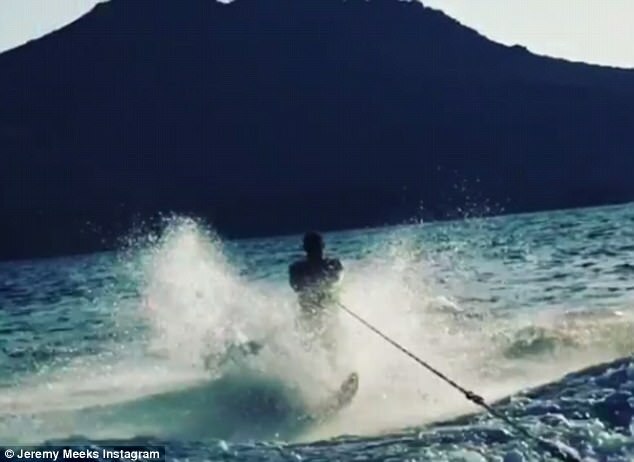 The display came just a day after his wife of eight years, Melissa Meeks, shared an emotional Instagram post. 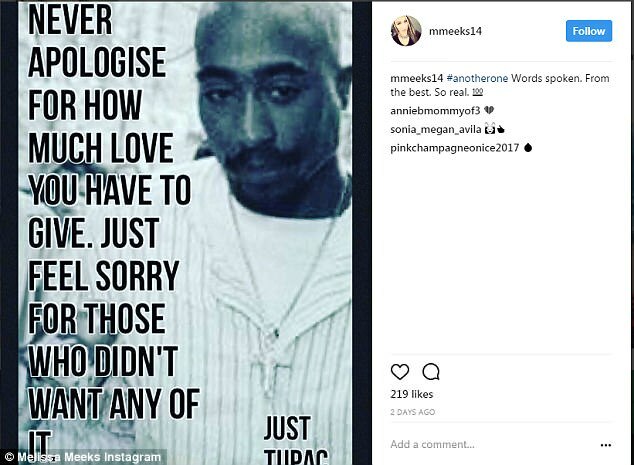 The mother-of-three, who he shares a son with, shared a meme of legendary rapper Tupac, which reads: 'Never apologise for how much love you have to give. Just feel sorry for those who didn't want any of it'. 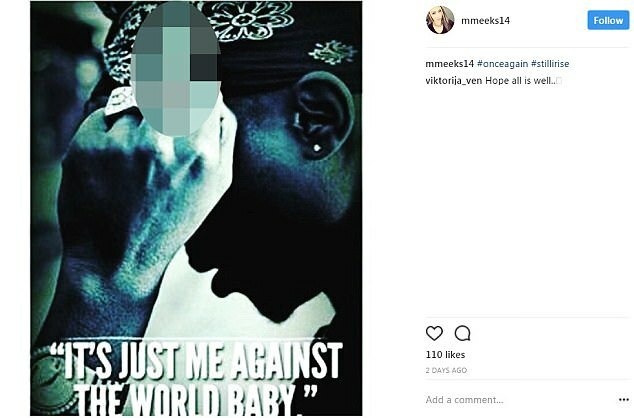 And somewhat tellingly, a day before that the brunette shared a snap of Tupac holding his middle finger up, with the caption: 'It's just me against the world baby,' with the hashtag 'Still I rise'. 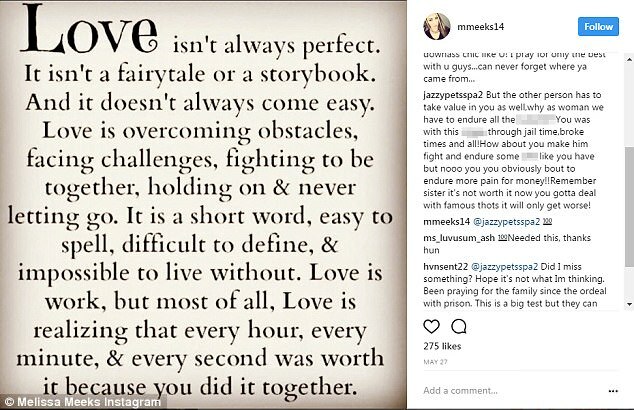 It looks to have been a bumpy ride for the dedicated mum, who last month shared a lengthy post admitting that 'Love isn't always a fairtytale'. And tellingly, she replied '100' to a follower, who wrote: 'But the other person has to take value in you as well,why as woman we have to endure all the bullsh**? !You was with this n***a through jail time,broke times and all!How about you make him fight and endure some sh** like you have but nooo you you obviously bout to endure more pain for money! !Remember sister it's not worth it now you gotta deal with famous th*ts it will only get worse!'. The display comes after he mingled at an array of star-studded events during the Cannes Film Festival last month. The hunk, whose smouldering looks have earned him a huge fanbase, made his first official modelling appearance at New York fashion week this year, and has certainly turned his life around in an impressive way since his release from prison. However his journey to stardom hasn't been all smooth-sailing, after he was recently barred from entry to the UK after arriving at London's Heathrow airport from New York. Speaking to DailyMail.com about the incident which prevented him from attending a work-related photoshoot, he said: 'I'm very, very saddened and confused. I went down there [London] with high hopes for the experience and the UK. 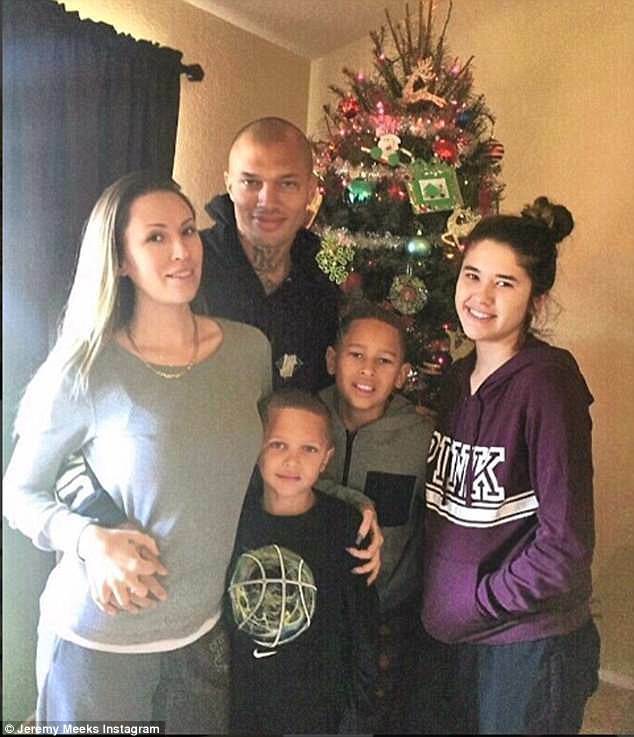 The California native shot to fame in 2014 when the Stockton Police Department posted his mugshot on their website, following his arrest for gang activity and a misdemeanour charge of resisting/obstructing justice. 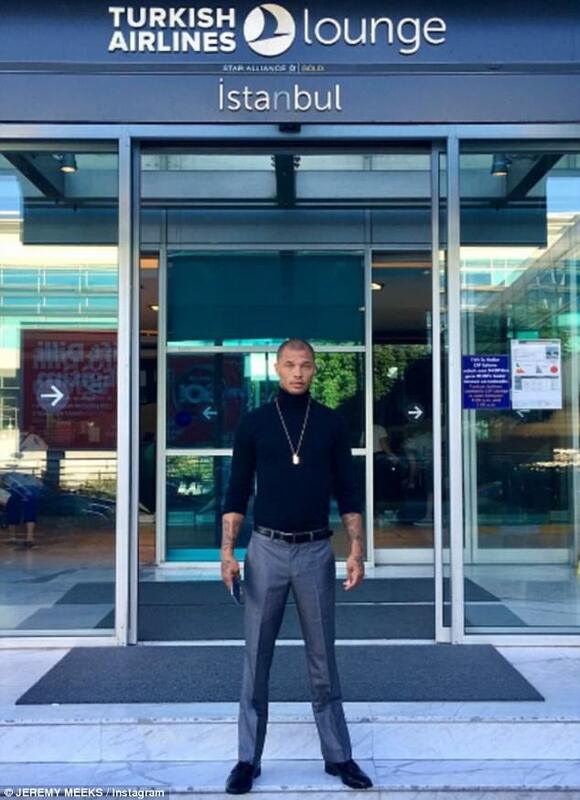 The photo promptly went viral, with internet users dubbing him 'the hottest convict ever'. 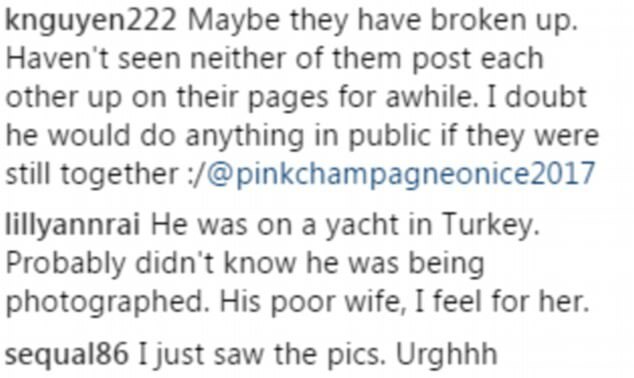 Dumb azz should be banging the heiress out of the camera's view and finessing her out of millions and connections to build and grow his future with his wife and kids, like a real mf G, RPGO style, but NOOOO, dumb azz dun got photographed by paparazzi...MR MEEKS, DO NOT COME BACK TO CALI BROKE, HOMELESS AND UNEMPLOYED!!! He was only attractive in his mugshot tbh. His tattoos are trashy and the way he carries himself is as well. I had no real expectations for him and I don't feel bad for his white wife holding him down. I really hope he is stacking some coins !!!! Because she will get tired of him soon.